One year. Four languages. No English. In September 2013, entrepreneur and popular blogger Scott Young, along with his friend Vat Jaiswal, boarded a plane heading to Valencia, Spain, knowing he wouldn’t speak a word of English for the entire year to come. Besides Spain, this one year adventure will bring him to Brazil, Taiwan and Korea, where he will push the boundaries and show the world what 3 months of total immersion in each country can do to improve fluency in a foreign language. The name of his project? 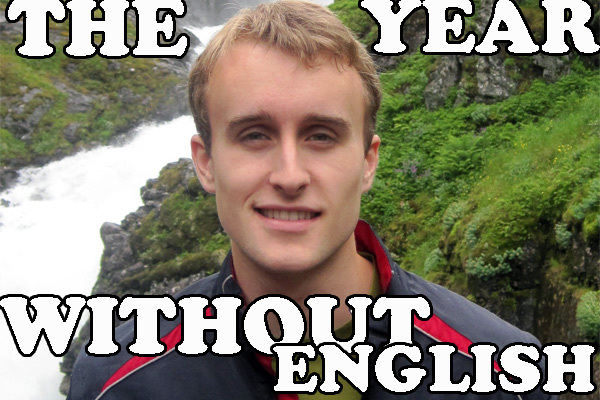 The Year Without English. As of late October 2013, Scott has been living in Spain for just under 2 months. The only exposure to the language he had had before boarding his plane for Valencia consisted of just 50 hours of study spread over a few weeks, mostly reviewing flashcard using Anki and listening to the Pimsleur method. Scott was kind enough to accept my request for an interview—in Spanish, of course, given that he can’t speak English (don’t worry, English subtitles are included). Despite having just a few weeks of exposure to Spanish under his belt, Scott managed to respond, confidently and without hesitation, to all of the questions I asked him. In the interview, he explains in detail his reasons for starting The Year Without English; his choice of Spain, Brazil, Taiwan and Korea as destinations to learn the local languages; his strategy for ensuring he does not speak any English; and the biggest challenges and lessons he’s encountered so far with his project. What do you think of Scott and Vat’s project? Do you think you could live for an entire year without speaking your native tongue? Do you think it’s a good idea to make your own challenge and push the boundaries like Scott is doing? Reply below, and don’t hesitate to ask Scott questions (preferably in French or Spanish!) that haven’t been covered in the interview, I’m sure he’ll be more than happy to answer them. 1:18 – What’s the reason you started this project in the first place? 6:59 – Why did you and your friend Vat choose Spain, Brazil, Taiwan and Korea as destinations to go learn the local language? 9:58 – Have many people tried speaking to you in English in Spain? 13:08 – What have been the biggest challenges you’ve encountered so far with your project? 16:42 – Will you spend the exact same amount of time learning all four languages, despite differences in difficulty? 19:58 – Conclusion; Scott talks about what the ultimate purpose of his project is and what he wants to tell the world. Wow, I really appreciate his enthusiasm and that he is going to do this year without his native language! He’s living the linguist’s dream! I had a similar experience with Swedish last year; I spent three months in Stockholm and did my best to immerse myself in Swedish all the time. My boyfriend of that time helped a lot by talking to me Swedish and even if I responded in English, he pretty much never responded in English. I found the first couple of weeks really difficult and there were times when I would get so frustrated that I would get annoyed with him. It’s only when I got back home at the end of the summer when I realised just how much I had learnt. I haven’t had much contact with Swedish since that summer and to confuse myself haha, I started Danish last year; so while my Swedish speaking skills are questionable (I tend to pronounce Swedish words slightly Danish now), I can understand virtually everything I hear and can follow tv shows and read books translated into Swedish that I have already read in English. Cool story! I heard Swedish and Danish are very much alike, is that correct? If so, that could explain why you would mix the accent! In any case, I think it was very nice of your boyfriend to speak to you only in Swedish. I heard that most Swedes usually speak to foreigners in English, so having that opportunity to really practice the language that way must’ve hugely helped. Thanks for sharing your experience, and I’m glad you enjoyed the interview with Scott! Wow! It’s the first time I see an anglophone speaking Spanish so well after such a short time. Congratulations, Scott! Yes, I was quite surprised myself actually. For having studied the language for just under 2 months, his level is quite amazing! Super, Kalisa! C’est super que tu veuilles apprendre l’espagnol et le russe. Si tu parles déjà français, tu vas voir que l’espagnol c’est pas si mal. Les temps de verbe se ressemblent et la grammaire, généralement, est similaire aussi. Si jamais tu as besoin de conseils, dis-le moi! Oui! En fait, j’ai déjà commencé a l’apprendre un petit peu (on dit “dabble in” en anglais) et je ne le trouve pas *difficile*. La prononciation est relativement facile pour moi (plus facile que le français, haha); j’ai aucun problème avec la lettre R car on la roule aussi en indonesién (ma langue maternelle). You bleeping rock man. What a fantastic journey you have set on. Your genius put into action is really incredible human drama unfolding. Your special and I feel a great sense of gratitude for having been a witness. Good luck and keep discerning. Scott, me gustaba mucho escuchar todo de ese proyecto y estoy muy contento de que decidiste a mostrar a la gente que si quieres hacer algo, puedes. Aunque querría saber eso de chino y coreano, ¿cómo te fueron esos idiomas? Muy bien hecho Scott, wow me gustaría mucho hacer lo que estas haciendo. Pienso que hablas con mucha confianza, y eso es lo que la inmersión te ha dado, y es la clave de comunicar tan bien, aunque veo algunos errores que haces. Yo aprendo español y francés, y estudio mucho la gramática de los dos (en mi colegio) pero el video me ha mostrado que la gramatica perfecta no es tan esencial para la comunicación, sino que la practica y la fluidez con que hablas son mas importantes. Me fascinara de ver como va tu ano, especialmente en china y corea. Solo tengo 16 anos y espero que yo pueda hacer algo asi! Buena suerte! A mistake I don’t quite understand, very common among English speakers is the regular misspronunciation of ce, ci, z as [s]. In Valencia they pronounce them as [θ] following the standard Spanish pronunciation. I can understand French, German or Italian speakers might have problems with that particular phoneme which does not exist in their own languages. Nevertheless, this phoneme does exist in English (think, teeth), so it should be easy to pronounce. Maybe it is hard to get rig of English spelling convetions. Certainly teachers should point out at it. The rest of Spanish speakers are not likely to say anything out of politeness or simply because pronouncing it as [s] is acceptable in Latin America anc certain parts of Spain. Que entrevista chevere! Ya habia lido este e-livro de Scott Young– http://www.scotthyoung.com/blog/Programs/HolisticLearningEBook.pdf. Me gustó del blog también. Felicidades por la iniciativa! Une année sans anglais … très interessant, et très difficile, je crois! Moi, je parle anglais, français, russe et maintenant j’essaie d’apprendre le coreén – en parlant des choses qui sont difficiles!